Christmas and all the festivities, as well as shopping, got the best of me last week and I just couldn't find the time to write up the post detailing some of my option moves. Although with Christmas I don't know how many of you had the time to keep up with blogs. Let's get into the moves. It should be pretty obvious by now that Nike is one of my favorite potential investments at these levels. 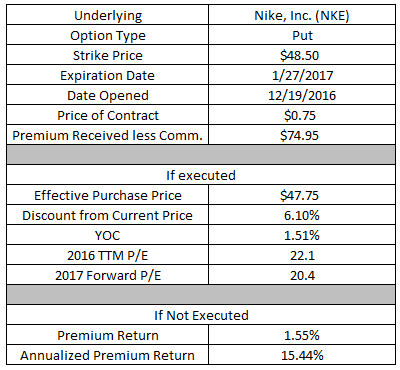 Ideally though I'd purchase shares below $48.50 which has led me to continually write put options on Nike to generate income in the meantime. You can read my full analysis on Nike over at Seeking Alpha. If the share price falls below $48.50 then I'll have to purchase 100 shares of Nike for the strike price less the premium received. That works out to an effective purchase price of $47.75. At the time the position was opened Nike was trading around $50.80 so my effective purchase price would be at a 6.1% discount. At that purchase price my yield on cost would be 1.51% based on the current quarterly payout of $0.18. That would represent a pretty good value based on the analyst estimates with a 22.1x P/E on 2016 earnings and 20.4x P/E on 2017's earnings estimates. If the share price stays above $48.50 then I'll get to keep the option premium as profit. Based on the capital at risk that would represent a 1.55% return in just over 1 month. On an annualized basis that's a solid 15.4% return. 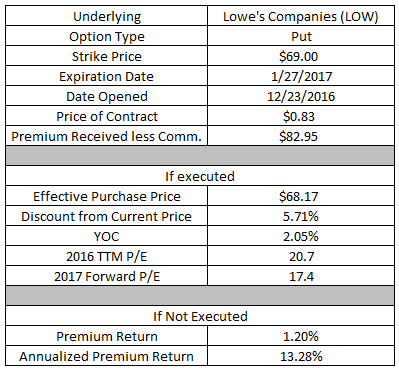 The first put option that I wrote on Lowe's Companies wasn't ideal, although it did represent a decent value. The share price has declined a bit since I opened the first one which has given me a chance to double down and write another put option with a lower strike price. If the share price falls below $69.00 then I'll have to purchase 100 shares of Lowe's Companies for the strike price less the premium received. That works out to an effective purchase price of $68.17. Currently the share price is trading at $72.30 so my effective purchase price would be at a 5.7% discount. At that purchase price my yield on cost would be 2.05% based on the current annual dividend. That would represent a pretty good value based on the analyst estimates with a 20.7x P/E on 2016 earnings and 17.4x P/E on 2017's earnings estimates. If the share price stays above $69.00 then I'll get to keep the option premium as profit. Based on the capital at risk that would represent a 1.20% return in just over 1 month. On an annualized basis that's a solid 13.3% return. Typically my option strategy involves selling put options; however, occasionally I sell call options too. One of the few positions that I have with over 100 shares is my former employer, Halliburton Company. Since I no longer work there and it doesn't exactly fit my investment strategy I've been cycling through call options to generate extra income now until the shares get called away from me. Since the shares were purchased via the ESPP program selling the shares on the open market at the current price doesn't quite make sense because I need the share price to be a bit higher for tax purposes. When I originally sold the call option back at the end of November I received $82 upfront via the option premium. The option premium acts as a quasi-insurance payment for sellers of options. Unfortunately to close the position I had to buy the option back which takes a bit out of the potential profit. However, that's fine by me because I was able to lock in a profit which is always a good thing. In total, after commission and fees, I was able to generate a $37.01 profit via the option premium. Based on the capital in play that represents a 0.64% return in about 20 days. On an annualized basis that's a solid 13.1% return. 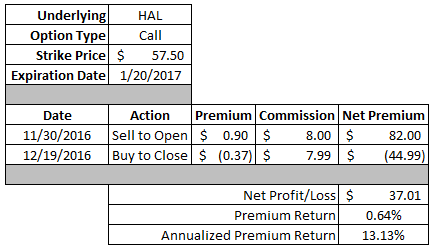 I'm looking at other possible call options that I can sell on my Halliburton shares in order to continue generating income until the shares are called away. A couple weeks back I decided to try out some new option strategies namely call credit spreads. I like the call credit spreads because they are limited risk so it's ideal for a smaller portfolio as a way to generate income if you don't see much that you want to buy outright. Unfortunately though your gain is limited as well. Compared to other option strategies a call credit spread is a bit more aggressive due to the directional bet that you're making. In order for you to make money the share price needs to decline. When I opened the call credit spread it entailed selling the $57.50 call option and buying the $60.00 call option. That provided a net credit of $121.46. To close the position I had to do just the opposite and buy the $57.50 option back while selling the $60 call back on the market. That was a net debit move which cost me a total of $83.79. All together the Starbucks Corporation call credit spread provided a $37.67 profit. Based on the margin required to hold the position, the spread between the strike prices or $250 in this case, that works out to a solid 15.1% return. On an annualized basis that's a fantastic 16,740.9% return. If only I could get that kind of annualized return all that time!!! While I like call credit spreads there is an obvious inherent risk that you are requiring the share price to move in a certain direction. As we all know that's far from being a certain thing especially over a short time period. The other big drawback is that commissions take a significant bit out of the profit potential. 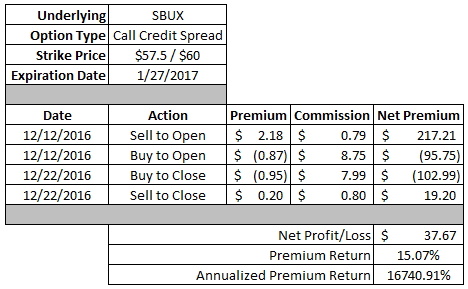 Using this credit spread as a example I paid over $18 in commissions to both open and close the position. As long as my commissions are as high as they are I'm kind of limited in the credit spreads I can make likely being forced to move up to $2.00+ credit spreads to make it worthwhile after commissions. If I find myself in future situations where I fully expect the share price to move lower over a relatively short time I wouldn't mind using call credit spreads. However, I think I need to go back and search for other option set ups that are limited risk, even if it limits my upside, that can offer a bit more profit potential for the same or similar amount of risk. Thus far in December I've generated $500.15 in profit from option premiums and YTD, really September to date, I've earned $726.56 in total profit. Although the YTD total does include the Target call option that is currently sitting on a loss. Since the position is still open via being rolled up and out the loss shouldn't be reflected in the totals. Excluding the Target call brings the YTD total to $1,050.30. 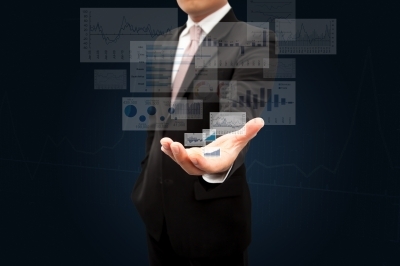 Have you used call or put spreads as a limited risk/limited reward option strategy? Or do you prefer to just stick with the basic covered call and cash covered put? Hi, JC -- really good to see your trades and to learn about your spread trades. For now, I'm going to stick to the basics because I still feel pretty much like a beginner as far as options trading goes. Where are you doing your options trades? I notice you're paying just $0.05 in commissions. That's certainly helps a lot! In my limited use of spreads they are good in theory, but commissions can easily make them unprofitable. So far calls/puts have been the best for me although I'm thinking of adding covered strangles to the mix as well. Those $0.05 commissions that I'm paying are really exchange fees I guess. I was able to get 500 free trades for my Rollover IRA so I'm definitely taking advantage of that. Once those are up then I'll be considering moving my IRA to another broker or using my option activity as leverage to get them to reduce my commission rates so options continue to make sense after commissions. We'll see how it goes. JC -- On your HAL option trade have you considered doing a rollout trade, since you are considering writing another HAL covered call in the future? That way you could save a little in commissions. Ideally yes I'd like to just roll the call to be able to cut down on the commission costs. However, in the case of HAL the energy sector is still quite volatile so I typically look to sell the call/open the position when oil or HAL has a decent run up under the premise that "what goes up, must come down". It's a bit of a gut feel kind of thing but I have to balance capturing as much option premium as possible while also not limiting my upside too drastically. JC, have you ever looked into selling puts and calls on other asset classes besides equities? One tactic I like to use is selling puts and calls on silver and gold ETFs (SLV and GLD, respectively). You keep writing puts at strike prices below the current price, and then when you eventually get assigned the shares, you start writing calls at higher strike prices until they're called away from you, and then you start over. This lets you generate income from precious metals, and they're not well-correlated with equities (especially gold), so it provides for more diversification.